You may associate gelatin primarily with colorful jiggly desserts, but this ingredient is used in a variety of common grocery and health products. Gelatin functions as a gelling agent, contributes to a smooth palatable texture in certain foods, and can be used as a thickening or whipping agent. Because gelatin is an animal-derived product, vegetarians in particular are concerned with identifying products that contain gelatin. Gelatin is a natural product derived from animal skin, bones and tendons. Gelatin produced in the United States comes primarily from pigskins or cattle bones. The most common forms of gelatin are powder or granulated products. Gelatin labeled kosher is also typically animal-derived, although vegetarian gelatin is available. Agar-agar, for example, which is derived from seaweed, is a vegan alternative to traditional gelatin. 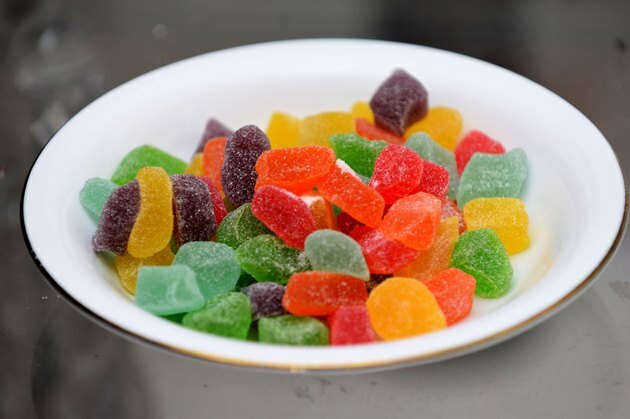 Besides the popular fruit-flavored gelatin snacks, gelatin is a common ingredient in other treats such as fruit chews, gummy snacks, gumdrops, marshmallows and puddings. Frosting, ice cream, yogurt, cream pies and wafers may also contain gelatin, according to the Gelatin Manufacturers Institute of America. Commercially baked cupcakes and frosted fruit tarts frequently contain gelatin, as well. The dairy section of the supermarket is replete with gelatin-containing products, including some varieties of sour cream, cottage cheese and cheese spreads. Ham, including canned ham, commercially prepared soups and sauces, wine, juice and some yellow-colored soft drinks may also contain gelatin. If you're trying to avoid gelatin, check food labels or call the manufacturer to verify that a particular product is gelatin-free. The use of gelatin is not limited to the food industry. Gelatin is also often used to produce capsules for medications and dietary supplements, and may be an ingredient in some medicinal syrups, according to the Gelatin Manufacturers Institute of America. Other applications for gelatin include photographic film and paintball products.